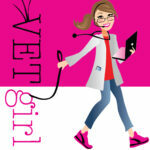 In this VETgirl online veterinary continuing education video, we demonstrate how to place an intravenous (IV) catheter. This is a common daily procedure that veterinarians and veterinary technicians must feel comfortable performing. To start, make sure to be well prepared and have all the supplies necessary in place (e.g., clippers, scrub, restrainer, white tape ripped into appropriate sizes, Tegaderm, multiple catheter sizes available, a t-port that has already been flushed with 0.9% saline or heparinized flush, injection port, etc.). The cephalic vein is often the most common and easiest location to use for catheterization. To start, have the restrainer gently holding the patient behind the elbow to secure the limb. Shave a wide margin to maintain a sterile field (Ideally, make sure to have a clean looking, symmetrical shave job, unless it’s a life-threatening emergency!). Make sure to avoid creating clipper burn or skin irritation. You can consider using a topical ELMA (e.g., lidocaine cream) if time allows. Gently scrub the catheter site, similar to surgical scrub preparation, starting from the center of the site and moving out to the periphery while scrubbing. Once this has been done, use non-sterile gloves for catheter placement. Carefully open an appropriately-sized catheter while maintaining sterility. Inspect the catheter to make sure that there are no defects, abnormalities, or burrs on the catheter. Palpate the vein above your sterile insertion site to visualize where you want to place the catheter, making sure to keep the site sterile and clean. While holding onto the hub of the catheter, insert the IV catheter directly into the vein at an approximately 10-30 degree angle; the bevel of the catheter should ideally be facing upwards. The non-dominant hand should be used to restrain the distal limb simultaneously. Ideally, the vein should be catheterized as distal as possible within the sterile field to allow for multiple attempts of catheterization if needed. Once blood starts to fill the hub, the catheter should be slowly inserted parallel to the vein in small millimeter increments to seed the catheter directly into the vein. Once the catheter is thought to be seeded within the vein, the catheter should be inserted over the stylet (typically with the forefinger), without moving the location of the stylet. 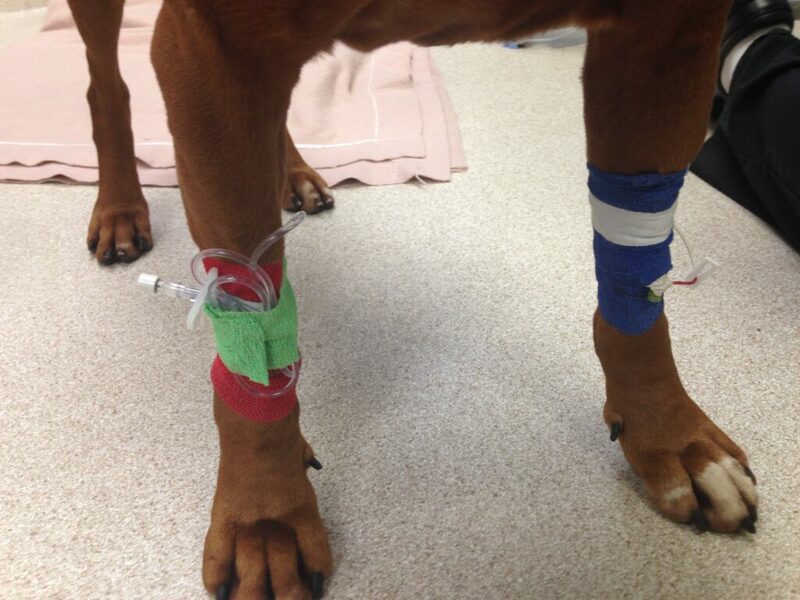 Once the catheter is in place, it should be secured in place with white tape (e.g., securing the tape around the catheter hub and t-port) and vetwrap as needed. A small piece of Tegaderm can be used to place over the insertion site – this will protect the site and allow for daily visualization as needed. Make sure not to tape the catheter in too tight, or toe swelling can occur. The flushed t-port can now be secured onto the catheter with an injection port as needed. A few hints: First, the restrainer can gently occlude the vein once blood fills the hub to prevent further blood contamination during catheter placement. Second, place butterfly tabs on your white tape to help with rewrapping of IV catheter if necessary. Lastly, you can use a small cotton ball soaked in alcohol and touch it as needed to prevent the tape from sticking to your gloves. Online continuing education is one of the best education method for study. This is very helpful for people who wish to further studies. I have seen a lot of IV cath placement videos over the years. Honestly, like I scoured the internet to find one as accurate as this. Thank you so much for this video. I will be sharing it! Can I flush my t-ports 24 hours prior to using them? Just to have them ready for next day. Or would this increase the risk of bacteria? In general, as long as it was aseptically prepared, it should be ok!